3-5 was an impressive way to announce Ger Aylward’s arrival. 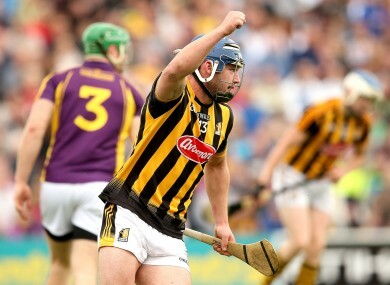 Ger Aylward celebrates hitting the net against Wexford yesterday. DESPITE ALL THE talk of retirements and transition, it was business as usual for Kilkenny yesterday at Nowlan Park. They cruised into yet another Leinster senior hurling final with a 24-point destruction of Wexford. And in the process, Kilkenny rolled another attacking star off the conveyor belt to prove that their production lines are still in working order. 23 year-old Ger Aylward may not have been familiar to the wider hurling audience before yesterday’s game but he fired 3-5 from play on his first championship start to firmly announce himself on the senior stage. But where did this left field inclusion to the Kilkenny forward line come from? Yesterday was Aylward’s first senior championship start but it wasn’t his debut. In 2013, he came off the bench in the Leinster semi-final replay defeat against Dublin and the All-Ireland qualifier win over Tipperary. But injuries hampered his involvement last year and the Glenmore club man was a bystander as Kilkenny swept to All-Ireland glory. In 2013, Aylward made his senior breakthrough in the league with starts against Waterford, Clare and Cork in March of that year. He struck 1-1 apiece against the Deise and the Banner but didn’t start a game in Kilkenny senior colours for the remainder of the season. In fact it wasn’t until 15 March this year that he was back in the Kilkenny starting line-up for a competitive senior encounter. That clash against Tipperary was not an auspicious outing as Aylward was held scoreless and replaced as Kilkenny slumped to a 12-point loss. He came on as a sub in late March in Nowlan Park, firing a point in their regulation league game against Clare. But despite that lack of exposure, Aylward was pitched in yesterday from the off. He repaid Brian Cody’s faith in him as he wreaked havoc on the Wexford defence and troubled the scoreboard operator throughout. It was a dream debut yet Aylward’s potential has been apparent for some time. He featured in the 2009 and 2010 All-Ireland minor finals, winning the latter against Clare. In 2012 he shot 1-1 against Clare but defeat was Kilkenny’s lot in that All-Ireland U21 final while in 2013, his last year operating at U21 level, Kilkenny were struck down in a Leinster final below in Wexford Park. Free from the shackles of injury, Aylward was able to make a convincing case for selection since the league and his inclusion proves the worth Cody places in players burning up the training ground. Last year Cody pitched in Mark Kelly for their championship opener against Offaly and he bagged a pair of goals. As the summer altitude got higher, Kelly found it difficult to replicate those scoring feats and certainly Aylward will face stiffer challenges. His threat has been advertised now and Leinster final opponents Galway will be on their guard. But in the stocky and robust Glenmore man, Kilkenny look to have discovered another forward with a devastating scoring touch. Email “Where did Kilkenny's latest attacking scoring star come from?”. Feedback on “Where did Kilkenny's latest attacking scoring star come from?”.